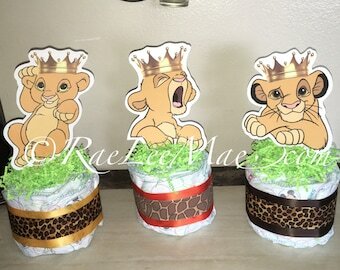 This is for a set of 5 Diaper Cake minis!!! When you check out you must put in notes to seller the date you need your order by. Please put a date prior to your event date as your order will arrive on or before the date you enter. If you do not give us a date your order will ship in 4 to 6 weeks. Once cake is disassembled all items are ready to be used by baby! No glue or tape is used on diapers! IF YOU DO NOT TELL ME WHAT YOU WANT I WILL SEND YOU ALL OF THEM WITH GREEN LARGE RIBBON AND WHATEVER SMALLER RIBBON I HAVE AVAILABLE!!!! 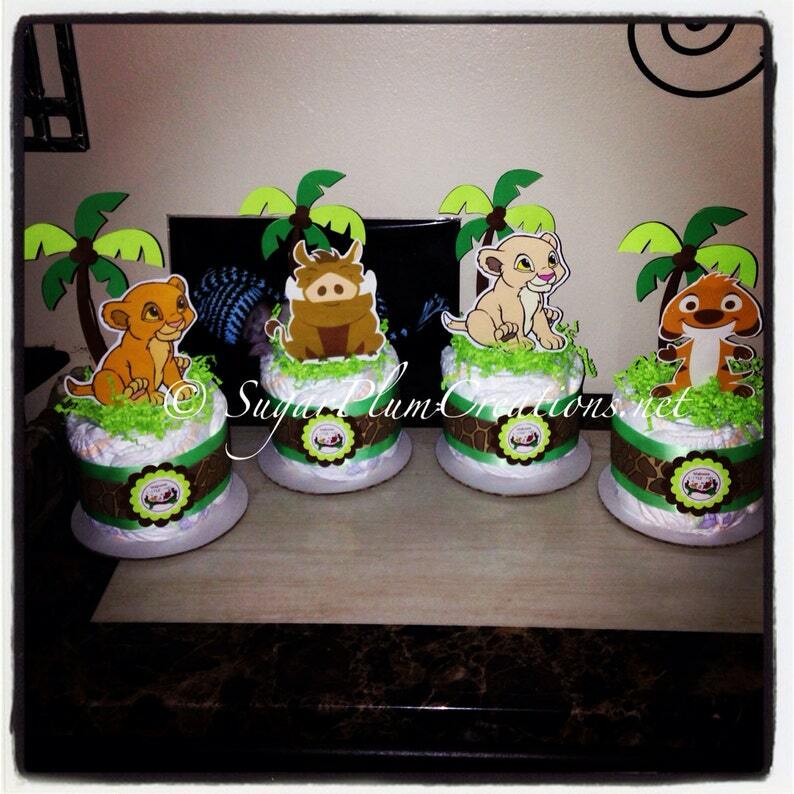 Two and three tier cakes sold separately message me for pricing! The diapers themselves are approximately 5.5” tall and the palm tree is approximately 7” tall. The characters range from 5”-6” tall. But there is also the shreddded paper. What I like to do is pull the palm tree up slightly so that it is standing taller than the rest. So it’s about 14-15” tall. If you want to order each character separately please send me a message! Additional shipping fees will apply to ship to Puerto Rico or anywhere outside the United States. Please message me before purchasing for a shipping quote. All items are made specific to your needs and are made at time of purchase. All sales are final. No cancellations, No returns and No Refunds!